Basic Description This sculpture relies on a magnet encased in a piece of wood, covered by a thin sheet of plastic. Metal parts placed on top of the base become magnetized and this gives them very interesting properties. You can shape the parts as if they were a single mass; its very fun to play with while you are talking on the phone etc. Think of it as a 3D doodler. Materials Small piece of wood, magnet, thin plastic sheet, glue, washers or other small magnetic parts. A complete material list is provided below. Tools Drill press with forstner bit, sandpaper. A complete tool list is provided below. #1 1 Hardwood. We used a small piece of walnut about 3/4" x 3" x 3" (20 x 75 x 75mm); any quality wood will suffice. #3 1 Plastic sheet. The plastic sheet should be opague and thin. We recommend that the thickness be less than 1/16" (1.5mm) - you can use thicker plastic but this will minimize the effectiveness of the magnet. The sheet should match the dimensions of the wood. We used the black cover of an extra DVD case that was mailed to us as a promotion. #4 1 Cup or pot magnet. We used a cup magnet with a diameter of 2.25" (57mm) and had good results; a larger and stronger magnet would be even better. You can experiment with different magnets, but they must be able to be recessed into the wood you are using. #5 1 Screw to mount magnet to wood. If you are not using a cup magnet, you can glue the magent into the base. #6 - Glue to attach plastic sheet to wood base. 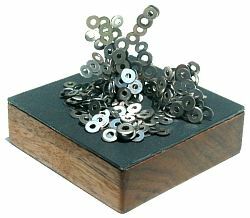 #7 - Magnetic washers or other small metal parts. We found a supply store that sells screws and washers by the pound and we purchased a handful of small washers. Bring a magnet and your plastic sheet to the store and experiment with different options. utility knife or saw to cut plastic sheet. drill press and forstner bit.